Two of Tocal's convicts were driven by desperate circumstances in England to commit crimes of protest in the form of rioting and machine breaking in 1826 and 1830. Most of these English protestors were villagers with no previous convictions. Handloom weaving of cloth in Lancashire provided employment and income for a large number of people. But by the 1820s this income was seriously threatened by factories with power-looms driven by steam engines. In April 1826 John Hoyle, married with one child, joined a mob of weavers who destroyed the power looms in a Lancashire village. He was arrested, tried and sentenced to death, reprieved and transported for life. On arrival in NSW he was assigned to James Webber at Tocal and worked there as a shepherd until 1831. John obtained a Ticket of Leave in 1837 and a Conditional Pardon in 1845. Below: The shipping record for John Hoyle shows his crime as rioting. Tocal's other English rioter was Robert West. In 1830 farm workers in 34 counties in the south and east of England rose up in a series of protests known as the Swing riots. The main focus of the Swing riots was the hated threshing machine - its widespread use was depriving rural labourers of their traditional winter work, the hand threshing of cereal crops. Other machinery was also targeted and Robert West was arrested for taking part in a mob attack on a paper mill near Norwich. Robert was a 50 year old ex-soldier, married with three children and no previous convictions. He was sentenced to death, reprieved and transported for life along with 480 other Swing rioters. On arrival in NSW he was assigned to James Webber at Tocal. In 1836 Robert West was transferred to Port Macquarie because of ill health and he died there in 1837. He is buried in what is now a park in the centre of the city. 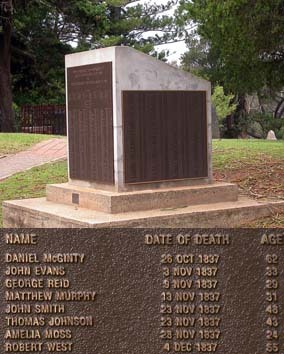 Right: Memorial to those interred in the old burying ground at Port Macquarie. Plaque detail shows the name of Robert West, Swing rioter and Tocal convict. Below: Calendar of Prisoners for trial in Norfolk 1831, listing Robert West.